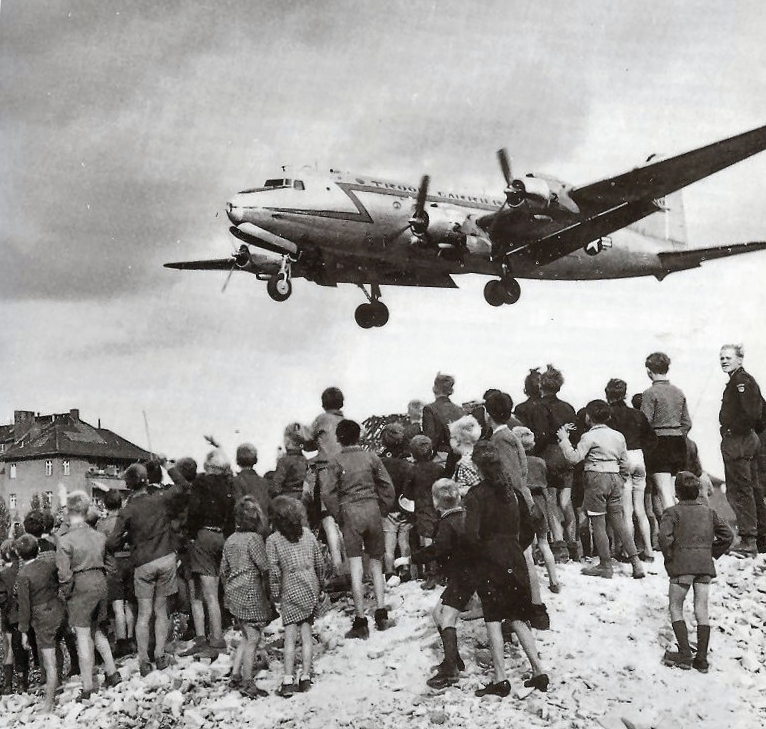 The airfield was paved in the center of the field at the edge of the city. Unlike the bomb blasted ruins where the dead rotted underneath the layers of rubble the plane was untouched by the war and alive with the new generations born from the spring. The meadow’s flowers blossomed among the green glades that sprang up as if reaching for the sun in the unblemished blue expanse. The airstrip was used by the armies that had just conquered the country. Their planes flew uncontested in the skies, the long shadows of the bomber and cargo planes cast themselves over the crumbling skeletal remains of the centuries-old cathedrals and houses of culture as they passed above their vanquished foes. Dozens of children dispersed throughout the field sprang up like prairie dogs in the tall grass at the sound of the approaching engines. The massive bombers that only recently dropped payloads of fire and death on the city were now jettisoning chocolate. The aircraft became a silhouette as it passed across the sun. The children simultaneously craned their necks when they came under the belly of the machine and all at once cashed after the descending aircraft. The coveted chocolate morsels came attached to small fluttering white parachutes that wafted gently down to earth. The children positioned themselves under the falling candy as it gently twisted in the breeze. The sweet morsels rained across the field, and the hungry boys and girls went about tirelessly hunting down each and every bar. Many of the children were war orphans who hadn't eaten anything of substance since the last handout that came from the occupiers. Most of them quickly ate up the blessing from the sky; others scurried away with their prize back to whatever miserable den they'd made for themselves in the destruction. Christof and Fabian were life long friends, they and what was left of their families had made it through the war because of the mutual support they provided each other. Both families had lost all their older male members to the war, and even though they felt it their responsibility, neither boy was able to take on the duties of the family patriarch. Their mothers and older sisters had to find a way to scrape out a living clearing the rubble and the bodies from a crater-pocked city. Helping cart off the shattered fragments of their homes and the piles of their neighbors and loved ones was the only way to provide for their respective broods, each living on the edge of starvation. Collecting the chocolate was one of the few ways the boys could hope to contribute to their survival. Between the two of them, they had gathered up five of the Hershey bars dropped by the plane. They each had two to bring home so they decided they could divide the fifth amongst themselves. Hunger superseded guilt, and they reasoned that since if it weren't for them taking the time to find the chocolate, there would be nothing to bring home, so they were each entitled to half of the fifth bar. With unrestrained excitement, Fabian tore the wrapper from the top corner all the way down to the bottom. He then turned it horizontally and broke it into two even halves. Christof held his hands out, and Fabian dropped his half of the sweet loot in his palm. Christof took a bite out of the entire half while Fabian methodically broke up his portion square by square careful to savor every piece. The pain of hunger was briefly dulled. Fabian wadded up the wrapper and threw it over this shoulder. “Let's go home,” he suggested so they wouldn’t have time to rationalize eating another entire bar. They were almost out of the field when they came across four other boys lingering around a small tree. Fabian sped up pretending not to see them, Christof quietly followed his lead. “Hey you there,” said the biggest boy. Christof slowed down, but Fabian kept walking. “Hey I was talking to you,” the boy repeated. “My name’s Henry,” he said with a friendly tone as he continued his approach. “I’m Fabian, and this is Christoph,” Fabian said suspiciously. “Nice to meet you,” Henry smiled. “That’s Eric, Walter, and the little one is my brother Albert,” each boy subserviently waved with his introduction. “Nice to meet all of you,” Christof said nervously taking a step back from the advancing Henry. “Hey did you manage to find any Chocolate?” Henry asked. Fabian quietly resumed walking away towards the city and Christof stumbled on following. “Can I ask you to spare any?” Henry asked. “My little brother is very hungry, and if I don’t feed him, there’s a good chance he won’t make it.” All three boys were now slowly walking behind Henry. “I’m sorry,” Fabian said briskly. “Just one piece please,” Henry feigned his plea. “Christof run!” Fabian shouted giving his friend a shove. They ran as fast as they could, but they couldn’t outrun the tiny band of child robbers. The three smaller boys quickly decided on Christof and brought him down like a pack of wolves. When Fabian turned to see what was happening Henry fell upon him with a massive blow to the head that sent Fabian down. The boys tormented their prey with kicks to the ribs and punches to the face. Only after they drew blood did they take the chocolate bars and leave the battered boys writhing in the dirt. Exhilarated by their act of piracy and violence the child gang gathered up the chocolate they had beaten out of the other children on the field and raced back to the city. When they stopped to catch their breath, Henry took one of the bars and tore open the wrapper. He promptly broke it up into four pieces and handed them out to his crew. “Why would Anton find out?” Henry asked lowering his eyes. “I don’t know,” Walter said looking down at his feet. “You won’t tell him will you?” Henry asked taking as he took a menacing stride towards Walter. Walter nodded, “I swear,” he repeated. “Swear on your father’s grave,” Henry said clenched his fist. “I swear on my father’s grave,” Walter muttered. “Good,” said Henry. “We’re the ones who go and get the chocolate if we take that’s up to us,” he declared defiantly. They boys all agreed, and each ate his piece of the forbidden treat. Anton was a robust man with a stubbly gray beard, beady dark eyes, a shaved head with a bulge in his receding hairline. He was in his fifties, and this was the second catastrophic war he had seen in his lifetime. In the previous Great War Anton was a soldier, but this time he endeavored not to fall victim to the deprivations of wartime. He spent his time getting ahead of the rest of the community by stockpiling everything he could, and the seemingly endless supply of war orphans had helped fill his cellar with canned rations, packs of cigarettes, coffee, and of course chocolate. Essentials of modern life he used as leverage to get what he wanted from the masses of people broken by their desperation. Anton's operation was based in the cellar of a house that had survived the destruction rained down by the fleets of bombers. There was always people qued up outside waiting for an audience with the self-made baron of the ruins. Men came to offer their labor in exchange for whatever he may offer, women and girls came to sell themselves for enough food so their sons and brothers might live to see another day. They knew Henry was an employee of Anton’s and they let the emboldened boy push past them on his way to the door. He knocked hard. “Who's there?” Anton shouted from the other side. After a moment the door opened, and Anton was there staring down with a stern gaze. “What is it?” He asked sounding almost annoyed. “We brought you this,” Henry said proudly holding up the small buck of cholate bars. Anton nodded approving. “Come inside,” he said. They followed Anton inside, and he closed the door behind them. They descended the rickety stairs into the cellar. A kerosene lantern burned in the smoke filled haze. The earthen walls were covered by shelves stocked with carefully organized provisions. Anton took a seat at a small round table. Henry stepped forward and spilled the dozen chocolate bars onto the circular surface. “Good, good,” Anton said with a grin. “Thank you,” said Henry said standing as straight as a soldier at attention. “Alright let me see what I have for you,” Anton said standing up and walking over to one of the overburdened shelves. The boys watched with hungry eyes and irrepressible smiles. Anton turned back to them. He was carrying a loaf of bread and a pack of cigarettes. “This is yours,” he said. Henry was big for his age, but the robust Anton still towered over him. He held out the bread and cigarettes, but as Henry reached for his prize, he quickly pulled it away. “Now you didn’t eat any of my chocolate did you?” Anton asked suddenly. “No sir,” said Henry with a shaky voice. “Are you sure?” Anton asked. “Yes, what?” Anton said cocking his head and bending down to force eye contact with the frightened boy. Anton fired his gaze at Albert, “is he telling the truth?” he asked. Albert nodded yes and looked down at the floor. “What about you. Is he telling the truth?” Anton asked Eric. “Yes, sir,” Eric said trying to keep from trembling. Finally, Anton turned to Walter. “Now you, are they all telling the truth? If not now is the time to tell me,” Anton threatened. Henry resisted the urge to turn back and look at Walter. He felt his heart start thumping against his chest and the pain of anxiety washed away the hunger. “Yes sir,” Walter finally mumbled. Anton was silent. He looked at each boy again and quietly nodded. “Alright good,” he said as he finally handed the bread and cigarettes to Henry. “Now go if you come back tomorrow around dawn I may have some more work for you,” said Anton. The four boys raced up the stairs and back out into the street. They kept low as they returned to their little burrow, the whole time they kept the bread and cigarettes concealed so the human predators lurking in the debris wouldn’t take notice.